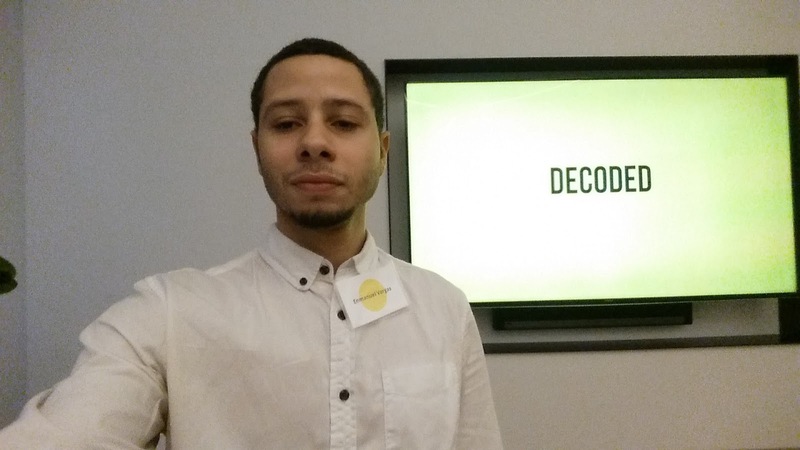 On March 21st, 2017, I could attend to the Data & Creativity Panel hosted by Decoded. The event consisted of a happy hour, a book launch and of course the discussion panel by four amazing women. 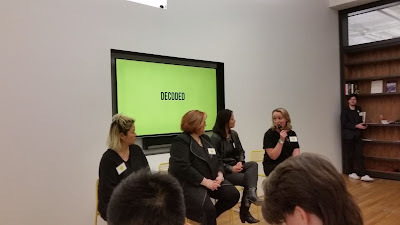 The event was conducted by Elizabeth Lukas – CEO of decoded North America, who have work for technology brands as Samsung, Sony, Sharp, IBM and others. The guest speakers were three leaders of the marketing and technology industry; KAY HSU the global Creative Lead at Instagram, Joanna Peña Former Global Chief Creative Officer at IBM and Becky Wang founder of Crossbeat a design agency based in NYC. It was my first time at decoded and I’m glad I found this conference because it was amazing to discover about them and their different programs to teach professionals to use data and technology. Those women in the panel are leaders in their industries and each one with a different focus but at the end using data to create. Kay Hsu who has been working for Instagram creating customize strategy solutions for advertisers. She explains how she has been combining technology and data, but also receiving feedbacks from those CEOs because it’s a learning process to build the right product. Joanna Peña described data as a mechanism consisting of three big elements; internet platforms, learning machine and systematic design. Becky Wang expressed that she sees creativity and data as a scientific method to solve problems. It is evident that the times are changing every day, technology and data are not exceptions of this change. "The data we know was implemented in communication, now it's all about connection." According to Joanna Peña. All resources available have been used to determinate how people behave and how to communicate them in the right way, but recently, data have been used to create marketplaces, to influence and to bring more utility and a better world. 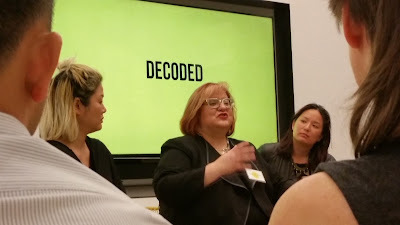 Kay Hsu considered that data have been using for professionals to plan strategically how to create content. It’s true how data is giving valuable connection but more and more important is how this data is helping people. "We can have all the world's data but what really matters is how we interpret it," said Kay Hsu. The key is to have the proper inference of it. The experience of these three women is something incredible, they all had examples for all scenarios. I remember one specific example made by Joanna about the Citi Bank when she had the opportunity to work with them. She realized how much data they have and how they use machine learning to understand costumers but also, they use it to come with new ways to develop products and services. “The information drives everything” explained Becky. It conducts people to buy, to influence others and to behave in some ways. Peña told the audience about how much data the NASA has and use, but the important thing is how fast they can process the information and make sense of it. In the other hand, Kay explained how competitive is the marketing field and how the winners in this industry are those who come up with relevant ideas and deliver value through their strategies in order to attract the attention. The brand relevance is the process of taking data and convert it into something consumers wants. Data can be use to understand the ways how people behave to improve their quality of life creating products as those apps for the weather or see how is the traffic this morning as Joanna also explained. In the panel, some good examples of how data is helping people through systematic products were mentioned as Alexa(Amazon) and City(Apple). Also in the health industry, doctors use data for diagnosis and it is changing the mobility industry with sensors in the wheels, cameras and automatic braking systems in new cars. Definitely data and creativity were made to work together. 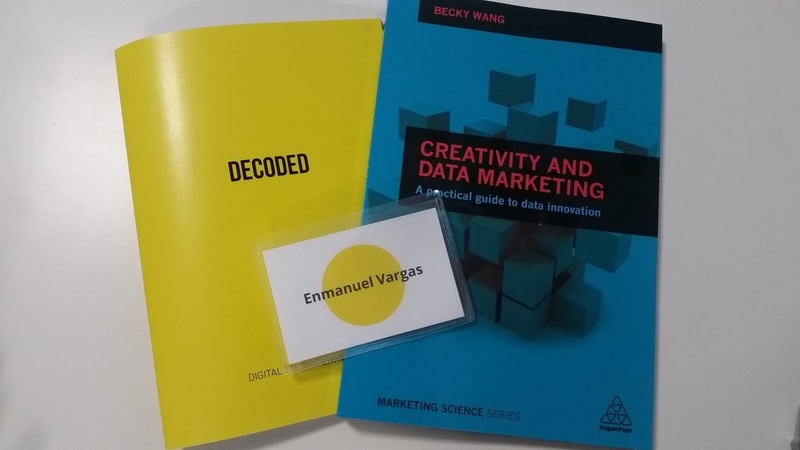 “Whatever is creating an experience with data is a good example” as Becky Wang said. It is important to improve people’s life but in communications, everything is about what the audience will remember and moments - experience can do that. What are the challenges and the potential outcomes? In this era, people think about the present more than anything else. In a few years, things become obsolete. “It is about now; maybe in 50 years, it will be only part of the history” as Becky Wang mentioned. It is surprisingly true that what was the trend yesterday is no the trend anymore and that is a big challenge. Data makes us discover how everything become different, where the things are going and how to create the right products/services for the right people. What about the data quality? Ms. Hsu working at Instagram has been facing this controversial issue of how true is the data provided by their systems, the Ad blockers, and others but for her “the quality of the data depends on the people who collect and analysis it.” At Instagram responsibility comes first and they work with the data each client need. As a recruiter what kind of talents are you looking for? At Instagram, they are looking for creative and strategy people who understand data and who can use it to build ideas. “They can be scientist or architects, for us, diversity is so important,” Kay said. I personally perceived a very competitive personality in the way Kay responded and when she said that they are looking for different points of view. “Google and Snapchat, we will take all of you guys”. Joanna is looking for diligent people to look for the big ideas. For them, it is important those who think that listening is cool, those who believe in reinventing. At the end, educators have the responsibility to teach new professionals to be critical thinkers. Joanna Peña – Bickley, Global Chief Experience Officer, Thinxmachine | Former Global Chief Creative Officer at IBM. Kay Hsu, Global Creative Lead, Instagram. Becky Wang, Founder, Crossbeat & Author, Creativity, and Data Marketing. It doesn’t matter how much data do we have available if we don’t make the proper analysis. Data must be used to improve people’s life, creating an experience and building those product/ services they need. Recruiters are looking for competitive people that came from different backgrounds but with strong skills to listen and to be diligent creating. “The quality of the data depends on the people who collect and analysis it” Kay Hsu. “The best examples are those which are creating an experience using the data collected” Becky Wang. “The data we know was implemented in communication, now it's all about connection" Joanna Peña. “It is about now; maybe in 50 years, it will be only part of the history” Becky Wang. This year #AWNewYork had 16 tracks. 18 venues. 1260 sessions a day. Times 5 days. Plus award shows and networking. It was Way. Too. Much. Content. Did you see the full program? Did it make you think HOLY SH*T!!! If you decided not to go because it seemed too overwhelming, this post might help. In it I’ll share some tips on how to choose what to see and do so that next year when you do attend, you don't lose your sanity. Obvious tip #1 - wear comfy shoes & layers There’s no way around it – you’ll have to walk all over hell’s half acre. So put on your cutest kicks. And don’t forget to bring a sweater or jacket for when they crank up the A/C. REMIX Summit brought together professionals from different industries to engage in conversation about the future of culture and community and creative ways to lead within. In the forum each creative leader from different industries exchanged insights and ideas from their field of expertise.